Sometimes food can really surprise you to the extent that you have to pinch yourself to believe it. Ah Ou Bangrak looked like any other street food vendor, and even without a lot of competition in the area. But it was anything, but ordinary. It was Thai-Chinese excellence all the way, and it started with swim bladders. A local friend of mine recommended Ah Ou Bangrak. You have to go there, he said. And he was absolutely right. There is no cheating on the quality here to keep prices low, he said. And yes, they do choose superb quality and charge what they need to charge. But as long as the cook are able to take advantage of the quality of the products, I have no objections to that. And they don’t overcharge. They serve dishes like stir fried fish maw (swim bladder), razor clams, Hong Kong style fried noodles with shrimps, tofu and seafood in gravy, pad kra-prao, fried crab in curry sauce and lots of other stuff. 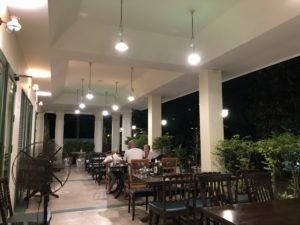 As you probably understand, most of the dishes are seafood based, but they also have pork and chicken alternatives on the menu. My personal preferences from my two visits are the razor clams, the fish maw (main picture), tofu in gravy, and the pad kra prao. And that is without having tasted the crab in curry sauce and the tom yam kung which will be on my table at the next visit. If going to Asiatiqe Shopping Mall, make sure you do your dining here (it’s really close by). Stir fried fish maw (kra por pla pad haeng) or bladder organ/swim organ doesn’t sound like a dish you eager to order voluntarily, but I can assure you, it’s a choice you wont regret. It’s a balloon like organ that some types of fish use to keep themselves floating and to adjust their depth. When fried, it’s soft and fluffy and socks up all the flavors. It’s really a lovely dish when properly made. And they give you the real thing at Ah Ou Bangrak, not substituting the bladder with pig skin as they do some places. If you’re offered fish maw for 50 or 60 bath, you are hereby warned, you’re being cheated. But thats not the case here. They throw in some sparkling fresh shrimps, bean sprouts and coriander into the bowl in exchange of 200 Bath. Another dish I really liked was the tao hoo nam daeng (tofu in a Chinese style gravy). It was mixed with pieces of seafood and ham and served in a pot. The tofu is sliced into chunks, then deep fried to give them a thin kind of skin. 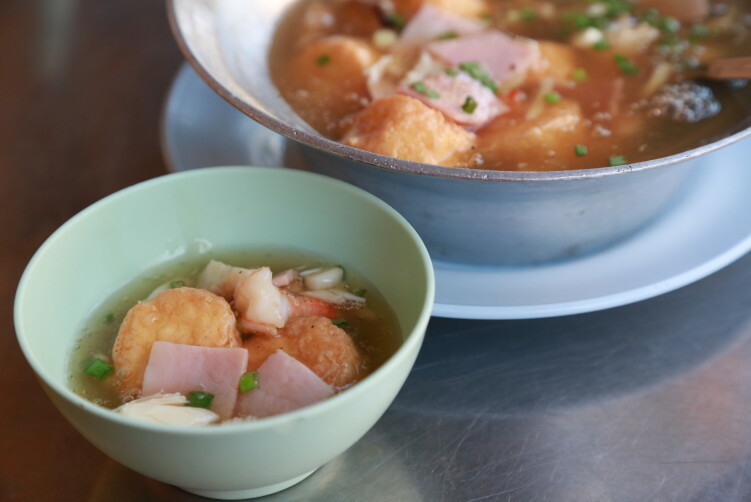 Shrimps, slices of ham and a bit of crab is then added to the gravy together with the tofu. The final touch is hints of pepper and shopped spring onions. The pepper really gives the dish an extra touch. The tofu is silky and soft. The fried razor clams with asparagus and mushrooms (pao hu sen pad nor mai faring) is a real delight with ultra fresh clams. Thick chunks of meat and very flavorful. The teture of the clams is a bit rubbery, like most other clams. It’s an expensive dish and it sets you back 600 bath, but is really worth it. Neither the fish bladder, the razor clams or the tofu dish are explosions taste wise. It’s delicate flavors, and very balanced taste wise. The Thai options on the menu has more powerful flavors than the Chinese options, but also they are well balanced. Like the pad kra pao (stir fried Thai basil with your choice of protein). That said, a classic pad kra pao would be one of the more flavorful dishes no matter where it’s served. Another must try is the mee Hong Kong pad hang (120 Bath), which is stir fried Hong Kong style noodles, meaning thin and long, nice and dry, and not to oily. Parts of the noodles had a slight char and hints of a smoky flavor, derived from the hight heat of the wok. It includes shrimp, bits of crab and chicken. 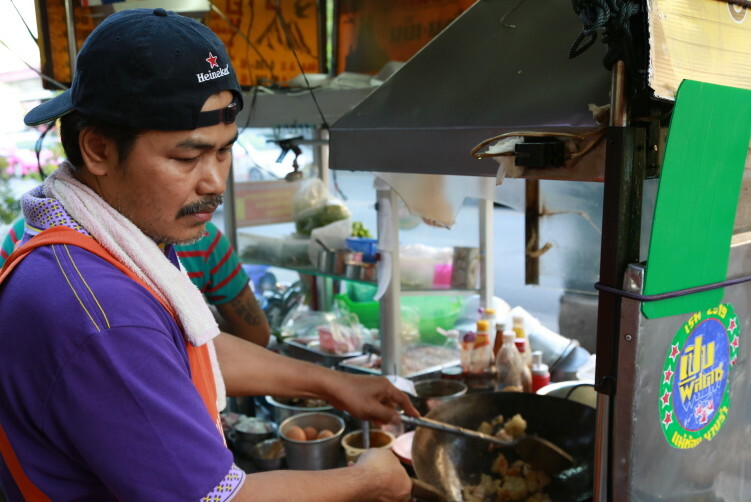 Bangkok is a street food city, but many of the best stalls have over the years moved in between three walls. 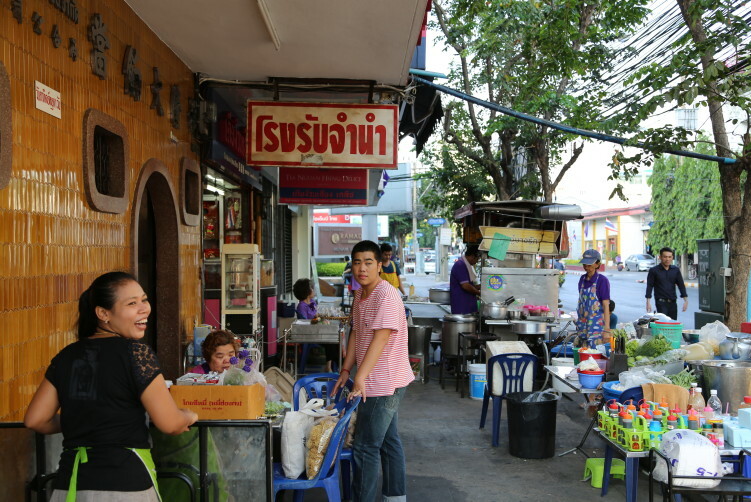 Ah Ou Bangrak is one of the upscale stalls still keeping their business in the open. There’s only one person doing the cooking so you should be prepared for a small wait. A popular choice among the more regular cliental seems to be a plate of hoy jaw, meaning deep fried bites of minced pork mixed with shrimp and wrapped in bean curd before it is deep fried. 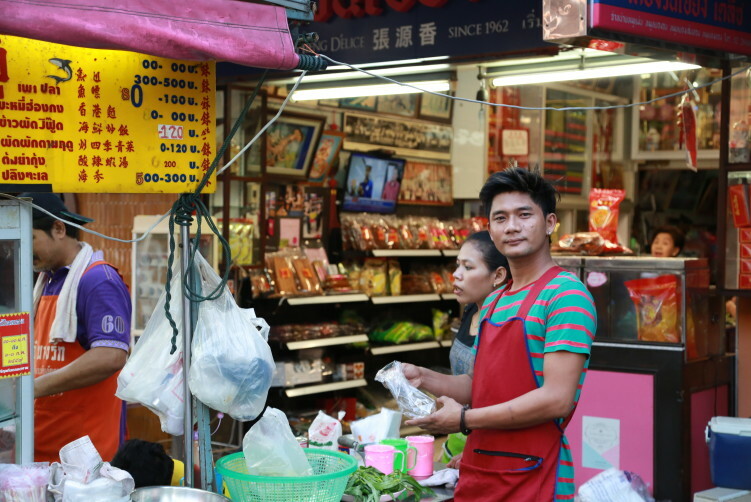 Overall, the prices are a bit higher than most other street stalls, but what you pay in the end is really returned by high quality ingredients and excellent tastes. Probably part of the reason why you see people roll up in premium cars. The menu includes english translations, but be aware that some dishes are not on the menu, so you need to ask for it. Also some dishes are season based, like sea cucumbers, and might not be available. http://rainypass.com/faq/ click here Name: Ah Ou Bangrak (Ar Ou) – (ร้านอาอู๋ บางรัก). Food: Upscale Thai Chinese. Especially seafood. Tao hoo nam daeng (tofu in a Chinese style gravy) is 200 Bath. Price: Medium priced. A full meal will be anything between 150-500 Bath, unless you also go for the razor clams that will add a few hundred more to your bill. High quality ingredients. buy now Open: 5pm- midnight. Suggest to come a bit after 5pm as they wasn’t completely ready to start serving when I turned up 5pm on my first visit.